My mom adopted Belle from a chain pet store where she lived probably close to 14 or so years ago. Her story was that she’d been left in a box on the humane society’s doorstep and for a great many years whenever mom tried to adopt a kitten/second cat, she would become very upset. So Belle became an only kitty, a pampered kitty, a very special kitty. When mom would get sick, I’d come and take Belle back to my place (with my kitty clowder) and she’d deal, but she’d always be happy to come back to live with her mommy. When mom came to live with us shortly after we moved, so too did Belle. And when mom passed way this fall, Her Highness The Supreme Queen Belle became my cat. Belle has high blood pressure and takes medication every day. She survived Bobcat Fever in 2017, and she happily lives in the room she shared with mom (which has now become a sub-office for me) and her “job” is to help me incubate goose eggs. Even though she’s pretty blind from the high blood pressure, she still gets around and is a very loving cat. My goal for Belle is to simply spoil her and let her time with us be as comfortable as possible. 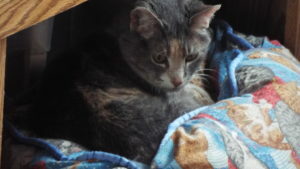 She’s doing well and though we both miss mom very much, I think she’s accepted her new reality and settling in as the matron of our group of kitties.